Why Won’t My Ouija Board Work? Working this tool becomes a practice of patience—of great patience—and of allowing your vibration (energetic makeup) to work alongside other vibrations. This translates to allowing a subtle energy to emerge between you and the spirit realm and this subtle energy is experienced by way of the planchette. This energy, which creates the movements of the planchette across the Board, spelling out the messages is so very subtle. It takes much practice and patience alone or with a partner, just sitting there with your fingers on top of the planchette waiting for a movement. It is such of a small movement at first that you will second guess yourself or your partner when it occurs. The first reaction is to wonder, “Am I pushing this or is my partner pushing this?” That is fine and that is common, but after awhile of allowing this movement as it glides all around the Board, regardless of the gibberish found in the early messages, as this is a part of the process, it will start to present legible messages. Know this, it is not easy for the energies to come through and use such of a device, let alone make contact at all! So, with practice and persistence with patience, between you and the energies you are contacting, the gibberish will slowly turn into words. With more practice and with more time as your fingers rest gently upon the planchette, while sitting at sessions that seem to be going no where, the words will start to flow in an orderly fashion, spelling out phrases for you. Those phrases will turn into sentences with meaning and those meaningful sentences can turn into paragraphs and even more. It’s truly up to you and where you want to take the communications, but it all goes back to taking the time for the spelling to occur. The key thing to do is to refrain from asking yes and no questions. Instead, always ask open-ended questions that allow the energies to take their time to spell out answers. Many novices get stuck in yes and no questions to hurry along the communications and messages, but you will be missing out on the reason the Talking Board was created in the first place and that was to allow the energies to communicate! Communication includes a dialogue and a dialogue can’t be had if you limit the communications to yes and no type of answers. This also makes the communication lazy and provides nebulous messages at best. So, I highly recommend you take the time to ask open-ended questions that require an answer, so you can assist the energies with using this tool, this device. Be respectful of their learning curve and, of course, of yours. An example of this would be, “please tell me your name or what name should I call you?” Notice, this question cannot be answered with a simple yes or no. Another example, “Tell me your story or what your message is?” Again, this requires spelling and a dialogue and not a simple guessing game of yes and no. Even though you may not receive coherent answers—messages—in the beginning stages of using this tool for communication, even though you are asking such open-ended questions, continue along this path of being patient with the energies, while they learn to use this tool to be in contact. Practice all three components: patience with this work, practice with your techniques and persistence with this method. Include respect for the energies you are reaching, while they are endeavoring to be in contact with you too and the rewards will be well worth the wait! Well, Jacquie, you must get beyond the fear of this tool–wood, cardboard, paper,etc. When you get beyond that and can really believe this and KNOW this within yourself, you will then successfully shift these experiences. You must remember that you are a powerful, divine being of light. You are a spirit yourself; it’s just that now you decided to experience yourself in a corporeal existence….but….from whence you came to whence you’ll go! So, interact with other energy forms from this place of being an empowered spiritual being of light. You will then draw such experiences to you and magnetize only that type of experience from other beings, regardless of all of the malarkey others would love to tell you from their own inexperience and especially from their own fears! Don’t own others’ fears. Instead, take your time, become a detective and do practices/studies that assist you to feel empowered from your Center. I do know (for me and my experiences) that it is safe to use a Board around anyone and in a home where children are. It’s just that I may not include them within my sessions because they may not be mature enough to understand what I am saying or doing. No need to scare anyone from your own fears or help deepen their own. Instead, use this tool quietly with others who feel the same about it or within your space. If your daughter is scared, it’s best to not share with her details or information about your exploration. After all, you are there to help her not be fearful in life and to help her grow and find her own empowerment. There is just no reason to scare her since she has her beliefs and they may be really set for her, just like they have been for you. You’re the adult, so you have a right to your privacy. There will come a time when you will know how to be empowered using this tool and from this space, you will be able to share with her someday, but do know this, many family members and friends may never understand your path with this tool. That’s okay! They get to believe what they want, but so do you. It’s best to not try to convince anyone of anything and just remain silent to your endeavors until the time is right, which could be, never. But…happy boarding to you! Hi Jacquie. Something to consider, all of us have the power of psychokinesis, which is the ability to affect objects and make them move, etc. It’s just that often we do not know when we are creating such energies to do so. So, let’s keep that as one option to your phenomenon. Also, there have been studies where having developing, pubescent teenage girls in the house, their own changing energy can create such phenomenon. Also, another thought to honor is that there are parallel worlds where other beings exist and sometimes they want to reach out and make their own kind of contact to let you know that they are there. I ask you, why go to a negative place when such activity does occur? You see, Jacquie, any of the above does not need to seem so frightening. It’s just that when we immediately assume that there is some spirit there that “is haunting” us is when we get scared and become fearful. I have found when we are open to any of the above ideas as well as the idea that there is an energy form that is just letting us know that it is present, it’s no different than contact from a Guide, Angel or Spirit Friend. Then the entire phenomenon can take on new meaning and can shift the energy to communication and conversations with these energies. And the communications and interactions can become helpful, insightful and even entertaining. So, what influences these interactions the most are our own beliefs about them. Try to come from a place of being like a “detective.” You are taking in all of the information, not jumping to conclusions, but instead, exploring the experiences. Thinking along these lines will also help your planchette to move. And, yes, I have had phenomenon happen and I share about that in my book, The Spirits of Ouija: Four Decades of Communication. I give suggestions on how to manage this and how to continue to have solid and uplifting communications and never fall trap to our own fears. Hi! my ouija board works but just when asking yes no questions or questions where the answers are numbers.It keeps spelling gibberish. Hi Salsabil. Well, the good thing is that your planchette is moving and you are receiving communication. To get beyond the binary communication of yes/no answers, you are going to have to ask ONLY open-ended questions. When you do this, you ask questions that must be answered with words, and the trick is being super patient with the spelling part. Receiving gibberish is part of the process and during this phase, continue pressing on by refraining from yes/no questions. Instead of asking for anyone to come speak with you, try asking for a transitioned loved one or better yet, ask for your Guide and/or Guardian Angel to come speak with you. Ask for their name or what you should call them. Ask them “why” questions. These have to be answered by words and sentences. Just stick with it while the communication is hard to decipher and after practice between you and this other energy(ies) connecting, the messages will become coherent in time. Hang in there….you are almost there! 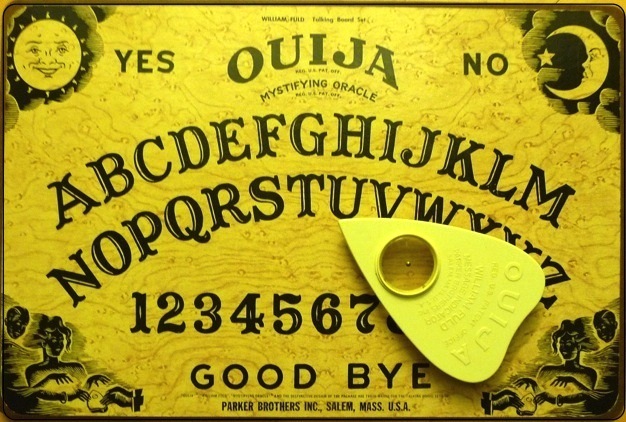 I first used my new oija board last night with a friend, nothing happened, but earlier this morning when we tried, it moved about an inch on it’s own, do you have any suggestions on places to go or questions to ask to make the connection between me, and the spirit world stronger? That’s progress, Lindsey and it does take patience and time for this tool to work! Ask to speak with your guardian angel. Everyone has an angel/guide. This “being” just needs to be asked to come into your life in more direct ways. So, establish this connection be inviting “them” to speak with you. Just know that it’s going to take a bit of time to get used to the very subtle movement of the planchette. Once you know what this feels like, the movement will become stronger. Hang in there! I recently got a new Ouija board because I can’t find my old one. With the old one i had results immediately, and the planchette moved fast and smoothly everytime. With my new one however, i got it to move a lot the first time I used it but it no longer moves at all. I found this odd do you have any suggestions? Hi Liv. Well, the good thing is that you know the Board can work for you since you have had success before! Now, there are times when using this tool for it to be common that nothing comes through. That is part of the process of learning to work with this tool. It could be that no energies are wanting to connect at that moment or it can be yourself–meaning, maybe you aren’t supposed to receive a message right then or maybe you are blocking the connections. That’s okay. It really is part of the process. So, what I recommend is the following: Be patient with those times that nothing happens and know that this too shall pass. It’s kind of like having a bad day that you know will eventually end. Do your best to not see this as a major issue or problem. It’s amazing how much of this tool working really has to do with our own inner workings. The tool works because we work! It works because we are allowing ourselves permission to reach into the unseen dimensions. Ask yourself if something internally may be blocking your abilities right now. It could be as simple as feeling sick, questioning your abilities at using this tool or even feeling “off” with your new Board. Try this….before you sit down to your next session, the day before tell yourself that all is well within yourself, you know you can have those connections again, you invite the energies to connect and then close your eyes and imagine what it feels like when the planchette is moving and the messages are coming through. Get it back into your head that this tool does work, but the times it comes to a standstill is okay, as that is part of the process. It’s like making a phone call and the person on the other end does not pick up and the call does not even go to voice mail. What do you do? You wait a moment and then try again. The most important thing I can tell you here is to stay positive about it working, being patient on those “off” days and KNOW that it will work again. Like the song goes: Pick yourself up, dust yourself off and start all over again… All the best with it! Mine does that too. I have no idea why either. However, since it left all of you shook up, then you can stop this communication by being clear within your intentions that you do not want to have such interactions anymore. If you choose this, then it’s best to close your mind, thoughts and senses to this experience. Send that experience you no long wish to have: light and thoughts of peace. Release is in love. But….from what you wrote above, you all don’t really want to do that, now do you? You and your cousin are curious. If you are curious then go about this logically. Do not have a younger child around when you do this work. If you can’t explain it and you have any fear that will only confuse the younger child. If you two explore it further, just ask questions and stay sensible. I wrote a book about how I dealt with such interactions while using this Board over many decades. If you decide to pursue this tool, I highly recommend you read this book, as I explain how to work with this phenomena, while keeping your wits about yourself and still getting to explore, discover and learn about the other dimensions from the spirits themselves. There really is nothing to fear, but your own fears, which are nothing more than created perceptions because you don’t currently have a way or a system to understand this natural phenomena. This can all change for you if this is your desire and ultimate goal. An excellent explanation of the Ouija Board! !